A gay man has accused the staff at Alaska Airlines of telling his partner to give up his seat so that a straight couple could sit next to each other. After my traveling companion and I had been seated in our assigned seats for a while, we were approached by the flight attendant and my companion was asked to move from his premium seat to coach, so a couple could sit together. I explained that we were a couple and wanted to sit together. He was given a choice to either give up the premium seat and move to coach or get off the plane. We could not bear the feeling of humiliation for an entire cross-country flight and left the plane. I cannot believe that an airline in this day and age would give a straight couple preferential treatment over a gay couple and go so far as to ask us to leave. We will never be flying Alaska Airlines or their recently purchased Virgin Airlines Group ever again. Thank you to Delta Air Lines for getting us home safe. If you are an #LGBT person, please spend your travel dollars with an LGBT friendly airline like Delta. 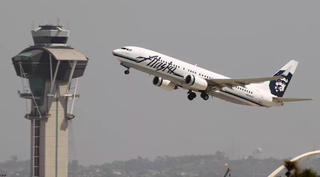 In a statement to Newsweek, Alaska Airlines said they are investigating the incident, but that the couple was “mistakenly assigned the same seats as another couple in Premium class.” Do you hear that? That’s the sound of a smarmy non-apology sprouting from its PR cocoon. Here it comes now! Uh, fine, except that still doesn’t explain why it was Cooley’s companion that they tried to banish to the hell that is coach. They were already in their seats! Interestingly, the airline has a page dedicated exclusively to “gay travel,” which depicts two men enthusiastically hiking. They seem to be having fun..or maybe they’re just overjoyed to finally see each other again after being forced apart during their freaking six hour flight. “To show our continued support we are encouraging the LGBT community to travel, not only to Seattle, but to Pride events and gay-friendly destinations all over the country,” it reads. Huh.